This is a list of first overall National Football League draft picks. The National Football League draft is an annual sports draft in which NFL teams select newly eligible players for their rosters. To be eligible, a player must be out of high school at least three years. Each NFL franchise seeks to add new players through the annual NFL draft. The draft rules were last updated in 2009. The team with the worst record the previous year picks first, the next-worst team second, and so on. Teams also have the option to trade with another team to move up to a better draft position. Teams that did not make the playoffs are ordered by their regular-season record, with any remaining ties broken by strength of schedule. Playoff participants are sequenced after non-playoff teams, based on their round of elimination (wild card, division, conference, and Super Bowl). From 1947 through 1958 the first selection was awarded by a random draw. The team which received this "bonus" pick forfeited its selection in the final round of the draft. The winner of the "bonus pick" was eliminated from the draw in future years. By 1958 all twelve clubs in the league at the time had received a bonus choice and the system was abolished. Before the merger agreements in 1966, the American Football League (AFL) operated in direct competition with the NFL and held a separate draft. This led to a massive bidding war over top prospects between the two leagues, along with the subsequent drafting of the same player in each draft. As part of the merger agreement on June 8, 1966, the two leagues held a multiple round "Common Draft". Once the AFL officially merged with the NFL in 1970, the "Common Draft" simply became the NFL Draft. Through the 2018 NFL draft, 83 players have been selected first overall, with the most recent being Baker Mayfield. The Indianapolis Colts – formerly the Baltimore Colts – have made the most first overall selections in history with seven. Of the first overall draft picks, 43 have been selected to a Pro Bowl and of those 43, twelve have been inducted into the Pro Football Hall of Fame. While the Heisman Trophy is awarded annually to the most outstanding player in U.S. college football, only 21 of those Heisman winners have been selected first overall in the NFL draft. Only five first overall draft pick players have been selected the NFL Rookie of the Year: Earl Campbell (1978); Billy Sims (1980); George Rogers (1981); Sam Bradford (2010); and Cam Newton (2011). 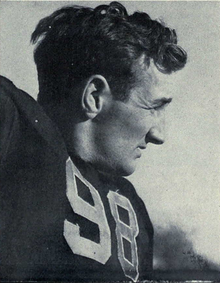 Tom Harmon was selected with the first overall pick in 1941 by the Chicago Bears. 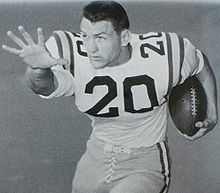 Billy Cannon was the first pick in the 1960 NFL draft. O. J. Simpson was drafted first overall by Buffalo Bills in 1969. John Elway was the first pick in the 1983 NFL draft. Orlando Pace was drafted first overall by the St. Louis Rams in 1997. Cam Newton was the first overall pick in the 2011 NFL draft. The Indianapolis Colts chose Andrew Luck with the first overall pick in 2012. Eight teams have made the playoffs in the same season in which they made the first overall selection in the draft. They were the 1968 Minnesota Vikings, 1978 Houston Oilers, 1982 New England Patriots, 1991 Dallas Cowboys, 2004 San Diego Chargers, 2008 Miami Dolphins, 2012 Indianapolis Colts, and 2013 Kansas City Chiefs. No team has ever gone from the first overall pick to a Super Bowl win in the same season. The Minnesota Vikings lost Super Bowl IV the year after they had the first overall pick. The Indianapolis Colts and the Los Angeles Rams have each held the first overall pick a total of seven times, the most of any NFL team. This includes the Colts' time in Baltimore and the Rams' time in Cleveland and St. Louis. Only four teams in the league have never held the first overall pick in the NFL draft: the Denver Broncos, the Jacksonville Jaguars, the Seattle Seahawks and the Baltimore Ravens. The Boston Yanks are the only defunct franchise to have held a first overall pick. Also had first selection in the 1984 NFL supplemental draft of USFL and CFL players. ^ In American and Canadian football, a back is a player who is lined up behind the linemen, the players who line up closest to the line of scrimmage. ^ Jay Berwanger did not sign with the Philadelphia Eagles. 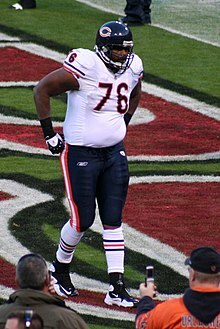 The Eagles traded his rights to the Chicago Bears; he did not sign with them either. ^ Billy Cannon signed with the AFL team Houston Oilers rather than the Los Angeles Rams. ^ Ernie Davis was subsequently traded to the Cleveland Browns after being drafted by the Washington Redskins. ^ a b c Because of the NFL–AFL merger agreement, the history of the AFL is officially recognized by the NFL and therefore this list includes the Common Draft for the years 1967, 1968, and 1969. ^ The Buffalo Bills were a part of the AFL when they selected Simpson with the first overall pick in the 1969 draft. The Bills joined the NFL the next year, in 1970. ^ Tom Cousineau chose to sign with the CFL team Montreal Alouettes over the Buffalo Bills. ^ John Elway was subsequently traded to the Denver Broncos after being drafted by the Baltimore Colts. ^ College seniors who had already signed with the USFL or CFL were not eligible for the regular draft. Instead the NFL held a three round special draft on June 5, 1984. The Tampa Bay Buccaneers selected Steve Young first overall in that draft. 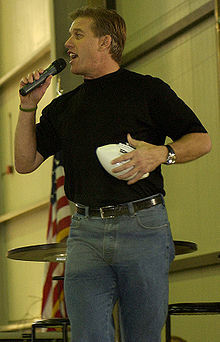 ^ Bo Jackson did not sign with the Tampa Bay Buccaneers and chose to enter the 1987 NFL draft the following year. ^ The Cleveland Browns – via the Buffalo Bills originally – possessed the number one overall pick but because they selected Bernie Kosar in the 1985 Supplemental Draft, the pick was subsequently given to the Tampa Bay Buccaneers. ^ The Dallas Cowboys originally possessed the number one overall pick but because they selected Steve Walsh in the 1989 Supplemental Draft, the pick was given to the Indianapolis Colts who originally held the second overall pick. ^ Eli Manning was subsequently traded to the New York Giants after being drafted by the San Diego Chargers. "Heisman Winners". Heisman Trophy. All Things Media LLC. Archived from the original on August 1, 2014. Retrieved May 12, 2013. "All Time Number 1 Draft Picks". NFL.com. NFL Enterprises LLC. Retrieved May 12, 2013. "Players drafted between 1936 and 2013, in the 1st round, with the 1st pick". Pro-Football-Reference.com. Sports Reference LLC. Retrieved May 12, 2013. "Heisman Memorial Trophy Winners". Pro-Football-Reference.com. Sports Reference LLC. Retrieved May 12, 2013. "NFL Hall of Fame Players". Pro-Football-Reference.com. Sports Reference LLC. Retrieved May 12, 2013. "Super Bowl History". National Football League. NFL Enterprises LLC. Retrieved January 6, 2009. "Associated Press Offensive Rookie of the Year". CBSSports.com. CBS Interactive. Retrieved January 6, 2013. ^ Clayton, John (March 26, 2009). "Draft order to change for playoff teams". ESPN.com. Archived from the original on January 26, 2010. ^ a b Zimmer, John; Marini, Matt, eds. (2013). Official 2013 National Football League Record & Fact Book (PDF). New York: National Football League. p. 525. ISBN 978-1-603-20980-9. Archived from the original (PDF) on October 11, 2013. Retrieved October 11, 2013. ^ "Draft History: 1940's". Pro Football Hall of Fame. Archived from the original on October 16, 2013. Retrieved October 16, 2013. ^ Cross, B. Duane (January 22, 2001). "The AFL: A Football Legacy". Sports Illustrated. Archived from the original on October 20, 2009. Retrieved June 9, 2010. ^ "NFL History by Decade: 1961–1970". NFL. Retrieved June 9, 2010. ^ "Time Changes for 2008 NFL Draft". NFL. April 22, 2008. Archived from the original on October 26, 2012. Retrieved June 9, 2010. ^ "Ki Aldrich NFL Statistics". Sports Reference LLC. Pro-Football-Reference.com. Retrieved December 9, 2010. ^ a b c "Bill Dudley NFL Statistics". Sports Reference LLC. Pro-Football-Reference.com. Retrieved December 9, 2010. ^ a b "Charlie Trippi NFL Statistics". Sports Reference LLC. Pro-Football-Reference.com. Retrieved December 9, 2010. ^ "1947 Chicago Cardinals". Sports Reference LLC. Pro-Football-Reference.com. Retrieved December 9, 2012. ^ "Harry Gilmer NFL Statistics". Sports Reference LLC. Pro-Football-Reference.com. Retrieved December 9, 2010. ^ a b "Chuck Bednarik NFL Statistics". Sports Reference LLC. Pro-Football-Reference.com. Retrieved December 9, 2010. ^ "1949 Philadelphia Eagles". Sports Reference LLC. Pro-Football-Reference.com. Retrieved December 9, 2012. ^ "1960 Philadelphia Eagles". Sports Reference LLC. Pro-Football-Reference.com. Retrieved December 9, 2012. ^ "Leon Hart NFL Statistics". Sports Reference LLC. Pro-Football-Reference.com. Retrieved December 9, 2010. ^ "Kyle Rote NFL Statistics". Sports Reference LLC. Pro-Football-Reference.com. Retrieved December 9, 2010. ^ "Billy Wade NFL Statistics". Sports Reference LLC. Pro-Football-Reference.com. Retrieved December 9, 2010. ^ "1958 Baltimore Colts". Sports Reference LLC. Pro-Football-Reference.com. Retrieved December 9, 2012. ^ a b c "Paul Hornung NFL Statistics". Sports Reference LLC. Pro-Football-Reference.com. Retrieved December 9, 2010. ^ "1961 Green Bay Packers". Sports Reference LLC. Pro-Football-Reference.com. Retrieved December 9, 2012. ^ "1962 Green Bay Packers". Sports Reference LLC. Pro-Football-Reference.com. Retrieved December 9, 2012. ^ "1965 Green Bay Packers". Sports Reference LLC. Pro-Football-Reference.com. Retrieved December 9, 2012. ^ "1966 Green Bay Packers". Sports Reference LLC. Pro-Football-Reference.com. Retrieved December 9, 2012. ^ "Tommy Mason NFL Statistics". Sports Reference LLC. Pro-Football-Reference.com. Retrieved December 9, 2010. ^ "Dave Parks NFL Statistics". Sports Reference LLC. Pro-Football-Reference.com. Retrieved December 9, 2010. ^ "Tucker Frederickson NFL Statistics". Sports Reference LLC. Pro-Football-Reference.com. Retrieved December 9, 2010. ^ "Tommy Nobis NFL Statistics". Sports Reference LLC. Pro-Football-Reference.com. Retrieved December 9, 2010. ^ "Bubba Smith NFL Statistics". Sports Reference LLC. Pro-Football-Reference.com. Retrieved December 9, 2010. ^ "1970 Baltimore Colts". Sports Reference LLC. Pro-Football-Reference.com. Retrieved December 9, 2012. ^ a b "Ron Yary NFL Statistics". Sports Reference LLC. Pro-Football-Reference.com. Retrieved December 9, 2010. ^ a b c "O.J. Simpson NFL Statistics". Sports Reference LLC. Pro-Football-Reference.com. Retrieved December 9, 2010. ^ a b c d "Terry Bradshaw NFL Statistics". Sports Reference LLC. Pro-Football-Reference.com. Retrieved December 9, 2010. ^ "1974 Pittsburgh Steelers". Sports Reference LLC. Pro-Football-Reference.com. Retrieved December 9, 2012. ^ "1975 Pittsburgh Steelers". Sports Reference LLC. Pro-Football-Reference.com. Retrieved December 9, 2012. ^ "1978 Pittsburgh Steelers". Sports Reference LLC. Pro-Football-Reference.com. Retrieved December 9, 2012. ^ "1979 Pittsburgh Steelers". Sports Reference LLC. Pro-Football-Reference.com. Retrieved December 9, 2012. ^ a b "1980 Oakland Raiders". Sports Reference LLC. Pro-Football-Reference.com. Retrieved December 9, 2012. ^ "1983 Los Angeles Raiders". Sports Reference LLC. Pro-Football-Reference.com. Retrieved December 9, 2012. ^ "Jim Plunkett NFL Statistics". Sports Reference LLC. Pro-Football-Reference.com. Retrieved December 9, 2010. ^ "1986 Oakland Raiders". Sports Reference LLC. Pro-Football-Reference.com. Retrieved December 9, 2012. ^ "Too Tall Jones NFL Statistics". Sports Reference LLC. Pro-Football-Reference.com. Retrieved December 9, 2010. ^ "1977 Dallas Cowboys". Sports Reference LLC. Pro-Football-Reference.com. Retrieved December 9, 2012. ^ "Steve Bartkowski NFL Statistics". Sports Reference LLC. Pro-Football-Reference.com. Retrieved December 9, 2010. ^ a b "Lee Roy Selmon NFL Statistics". Sports Reference LLC. Pro-Football-Reference.com. Retrieved December 9, 2010. ^ a b c "Earl Campbell NFL Statistics". Sports Reference LLC. Pro-Football-Reference.com. Retrieved December 9, 2010. ^ "Billy Sims NFL Statistics". Sports Reference LLC. Pro-Football-Reference.com. Retrieved December 9, 2010. ^ "George Rogers NFL Statistics". Sports Reference LLC. Pro-Football-Reference.com. Retrieved December 9, 2010. ^ "1987 Washington Redskins". Sports Reference LLC. Pro-Football-Reference.com. Retrieved December 9, 2012. ^ a b c d "John Elway NFL Statistics". Sports Reference LLC. Pro-Football-Reference.com. Retrieved December 9, 2010. ^ "1997 Denver Broncos". Sports Reference LLC. Pro-Football-Reference.com. Retrieved December 9, 2012. ^ "1998 Denver Broncos". Sports Reference LLC. Pro-Football-Reference.com. Retrieved December 9, 2012. ^ "Irving Fryar NFL Statistics". Sports Reference LLC. Pro-Football-Reference.com. Retrieved December 9, 2010. ^ a b "Bruce Smith NFL Statistics". Sports Reference LLC. Pro-Football-Reference.com. Retrieved December 9, 2010. ^ "Bo Jackson NFL Statistics". Sports Reference LLC. Pro-Football-Reference.com. Retrieved December 9, 2010. ^ "Vinny Testaverde NFL Statistics". Sports Reference LLC. Pro-Football-Reference.com. Retrieved December 9, 2010. ^ a b c "Troy Aikman NFL Statistics". Sports Reference LLC. Pro-Football-Reference.com. Retrieved December 9, 2010. ^ a b "1992 Dallas Cowboys". Sports Reference LLC. Pro-Football-Reference.com. Retrieved December 9, 2012. ^ a b "1993 Dallas Cowboys". Sports Reference LLC. Pro-Football-Reference.com. Retrieved December 9, 2012. ^ a b "1995 Dallas Cowboys". Sports Reference LLC. Pro-Football-Reference.com. Retrieved December 9, 2012. ^ "Russell Maryland NFL Statistics". Sports Reference LLC. Pro-Football-Reference.com. Retrieved December 9, 2010. ^ "Drew Bledsoe NFL Statistics". Sports Reference LLC. Pro-Football-Reference.com. Retrieved December 9, 2010. ^ "2001 New England Patriots". Sports Reference LLC. Pro-Football-Reference.com. Retrieved December 9, 2012. ^ "Keyshawn Johnson NFL Statistics". Sports Reference LLC. Pro-Football-Reference.com. Retrieved December 9, 2010. ^ "2002 Tampa Bay Buccaneers". Sports Reference LLC. Pro-Football-Reference.com. Retrieved December 9, 2012. ^ a b "Orlando Pace NFL Statistics". Sports Reference LLC. Pro-Football-Reference.com. Retrieved December 9, 2010. ^ "1999 St. Louis Rams". Sports Reference LLC. Pro-Football-Reference.com. Retrieved December 9, 2012. ^ a b c "Peyton Manning NFL Statistics". Sports Reference LLC. Pro-Football-Reference.com. Retrieved December 9, 2010. ^ "2006 Indianapolis Colts". Sports Reference LLC. Pro-Football-Reference.com. Retrieved December 9, 2012. ^ "Michael Vick NFL Statistics". Sports Reference LLC. Pro-Football-Reference.com. Retrieved December 9, 2010. ^ a b "Eli Manning NFL Statistics". Sports Reference LLC. Pro-Football-Reference.com. Retrieved December 9, 2010. ^ "2011 New York Giants". Sports Reference LLC. Pro-Football-Reference.com. Retrieved December 9, 2012. ^ "2007 New York Giants". Sports Reference LLC. Pro-Football-Reference.com. Retrieved December 9, 2012. ^ "Mario Williams NFL Statistics". Sports Reference LLC. Pro-Football-Reference.com. Retrieved December 9, 2010. ^ "Jake Long NFL Statistics". Sports Reference LLC. Pro-Football-Reference.com. Retrieved December 9, 2010. ^ "Cam Newton NFL Statistics". Sports Reference LLC. Pro-Football-Reference.com. Retrieved December 9, 2010. ^ "Andrew Luck NFL Statistics". Sports Reference LLC. Pro-Football-Reference.com. Retrieved December 9, 2010. ^ a b "Boston Yanks Draft History". Draft Finder. Pro Football Reference. Archived from the original on October 16, 2013. Retrieved October 16, 2013. ^ "Indianapolis Colts Number One Draft Picks". Draft Finder. Pro Football Reference. Archived from the original on October 16, 2013. Retrieved October 16, 2013. ^ "St. Louis Rams Number One Draft Picks". Draft Finder. Pro Football Reference. Archived from the original on October 16, 2013. Retrieved October 16, 2013. ^ "Tampa Bay Buccaneers Number One Draft Picks". Draft Finder. Pro Football Reference. Archived from the original on October 16, 2013. Retrieved October 16, 2013. ^ "Cleveland Browns Number One Draft Picks". Draft Finder. Pro Football Reference. Archived from the original on October 16, 2013. Retrieved October 16, 2013. ^ "Arizona Cardinals Number One Draft Picks". Draft Finder. Pro Football Reference. Archived from the original on October 16, 2013. Retrieved October 16, 2013. ^ "Detroit Lions Number One Draft Picks". Draft Finder. Pro Football Reference. Archived from the original on October 16, 2013. Retrieved October 16, 2013. ^ "Atlanta Falcons Number One Draft Picks". Draft Finder. Pro Football Reference. Archived from the original on October 16, 2013. Retrieved October 16, 2013. ^ "Buffalo Bills Number One Draft Picks". Draft Finder. Pro Football Reference. Archived from the original on October 16, 2013. Retrieved October 16, 2013. ^ "New England Patriots Number One Draft Picks". Draft Finder. Pro Football Reference. Archived from the original on October 16, 2013. Retrieved October 16, 2013. ^ "Philadelphia Eagles Number One Draft Picks". Draft Finder. Pro Football Reference. Archived from the original on October 16, 2013. Retrieved October 16, 2013. ^ "Pittsburgh Steelers Number One Draft Picks". Draft Finder. Pro Football Reference. Archived from the original on October 16, 2013. Retrieved October 16, 2013. ^ "San Francisco 49ers Number One Draft Picks". Draft Finder. Pro Football Reference. Archived from the original on October 16, 2013. Retrieved October 16, 2013. ^ "Dallas Cowboys Number One Draft Picks". Draft Finder. Pro Football Reference. Archived from the original on October 16, 2013. Retrieved October 16, 2013. ^ "Cincinnati Bengals Number One Draft Picks". Draft Finder. Pro Football Reference. Archived from the original on October 16, 2013. Retrieved October 16, 2013. ^ "Houston Texans Number One Draft Picks". Draft Finder. Pro Football Reference. Archived from the original on October 16, 2013. Retrieved October 16, 2013. ^ "Chicago Bears Number One Draft Picks". Draft Finder. Pro Football Reference. Archived from the original on October 16, 2013. Retrieved October 16, 2013. ^ "Washington Redskins Number One Draft Picks". Draft Finder. Pro Football Reference. Archived from the original on October 16, 2013. Retrieved October 16, 2013. ^ "New York Giants Number One Draft Picks". Draft Finder. Pro Football Reference. Archived from the original on October 16, 2013. Retrieved October 16, 2013. ^ "Green Bay Packers Number One Draft Picks". Draft Finder. Pro Football Reference. Archived from the original on October 16, 2013. Retrieved October 16, 2013. ^ "Minnesota Vikings Number One Draft Picks". Draft Finder. Pro Football Reference. Archived from the original on October 16, 2013. Retrieved October 16, 2013. ^ "Tennessee Titans Number One Draft Picks". Draft Finder. Pro Football Reference. Archived from the original on October 16, 2013. Retrieved October 16, 2013. ^ "New Orleans Saints Number One Draft Picks". Draft Finder. Pro Football Reference. Archived from the original on October 16, 2013. Retrieved October 16, 2013. ^ "New York Jets Number One Draft Picks". Draft Finder. Pro Football Reference. Archived from the original on October 16, 2013. Retrieved October 16, 2013. ^ "San Diego Chargers Number One Draft Picks". Draft Finder. Pro Football Reference. Archived from the original on October 16, 2013. Retrieved October 16, 2013. ^ "Oakland Raiders Number One Draft Picks". Draft Finder. Pro Football Reference. Archived from the original on October 16, 2013. Retrieved October 16, 2013. ^ "Miami Dolphins Number One Draft Picks". Draft Finder. Pro Football Reference. Archived from the original on October 16, 2013. Retrieved October 16, 2013. ^ "Carolina Panthers Number One Draft Picks". Draft Finder. Pro Football Reference. Archived from the original on October 16, 2013. Retrieved October 16, 2013. ^ "Kansas City Chiefs Number One Draft Picks". Draft Finder. Pro Football Reference. Archived from the original on October 16, 2013. Retrieved October 16, 2013.